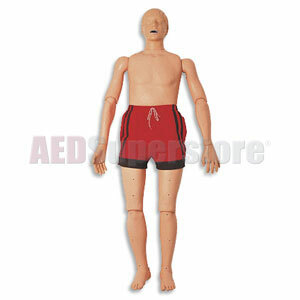 CPR capable manikin. Made of durable plastic with rust-resistant skeleton and articulated joints. Includes 5 mouth/nosepieces, 5 airway systems, and shorts. As this manikin fills with water, it will sink up to the neck. To take it to the bottom, add five to ten pounds of weight (not supplied). A brick will do. Please Note: This product ships directly from the manufacturer. Please call for lead time.